In years past, metal restorations were the only way to address dental damage while achieving strength and long-lasting results. At PQ Family Dental, we believe that a durable and resilient smile can also be beautiful. That is why we use the highest-quality dental materials available. Today, our team in Rancho Penasquitos, CA uses biocompatible tooth-colored fillings and porcelain restorations for a seamless and stunning smile. Indirect fillings, inlays and onlays are used to repair damage too extensive for a traditional filling. Here, we discuss who makes a good candidate for inlays and onlays so you can know if this restorative treatment option is right for you. Before we explore candidacy, we will briefly review how inlays and onlays work. These custom-made restorations are crafted from ceramic porcelain and are designed to fit within the tooth structure. 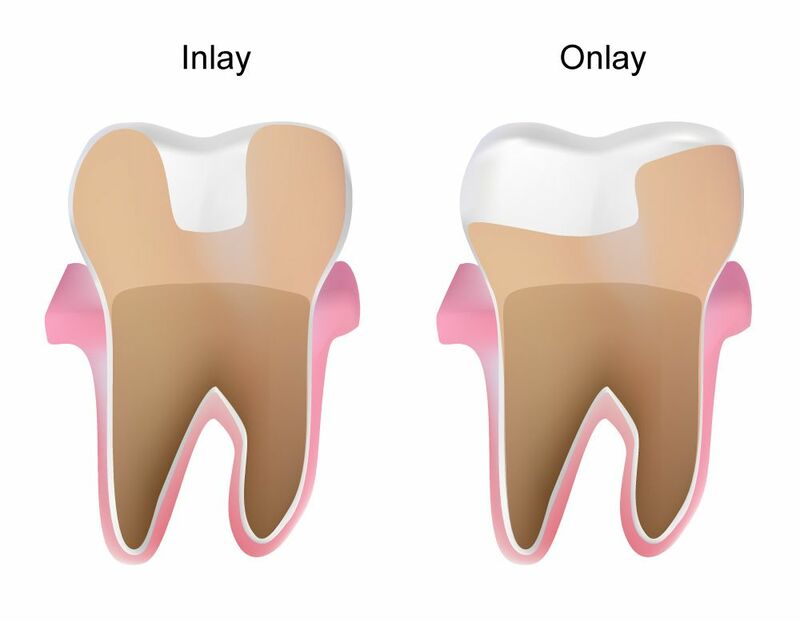 While an inlay rests between the cusps of a tooth, an onlay is designed to restore a larger portion of a tooth, including at least one cusp. These sturdy restorations replace areas of the natural tooth that have been damaged by decay or breakage. When properly cared for and maintained, inlays and onlays can withstand everyday forces such as biting and chewing for many years to come. In addition, PQ Family Dental offers same-day custom porcelain restorations using CEREC® technology. To begin the process, we will take digital impressions of your teeth, and then upload those image files to our CEREC software. Our in-house milling machine will then craft your restoration out of a solid block of ceramic porcelain. Simply stated, candidates for inlays and onlays will have too much damage for a traditional dental filling, but not enough damage to warrant the need for a crown. In order to be eligible for an inlay or onlay, you must have sufficient remaining tooth structure to support the restoration. For long-term dental health, we prefer to save as much natural tooth structure as possible. Therefore, when feasible, an inlay or onlay is a more conservative option when compared to a dental crown. Patients considering this type of restoration must be committed to practicing healthy oral hygiene habits. For long-lasting results, it is important to brush at least twice a day, floss once a day, and attend all regular dental visits. Who Is Not a Candidate for Inlays and Onlays? At PQ Family Dental, we believe treatment should be as predictable as possible. Inlays and onlays are not for everyone. For example, if you have a large cavity, we may recommend a dental crown instead of an inlay or onlay. A dental crown fits over the entire tooth, strengthening it and protecting it from further damage. If your doctor determines that a crown is the most suitable treatment option for you, we can utilize CEREC technology to fabricate a custom restoration during the same office visit. To find out more about our custom inlays and onlays, schedule a consultation with one of our doctors. As always, our team is available to answer any questions you may have regarding treatment. You can contact us online anytime or call us at (858) 484-9222 or (760) 789-6200.